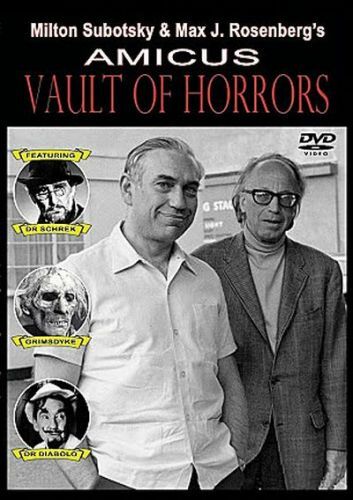 Celebrating the legendary partnership of Milton Subotsky and Max J. Rosenberg with the production company Amicus Productions, who along with Hammer Films, dominated the horror film genre between the 1960s and 1970s. 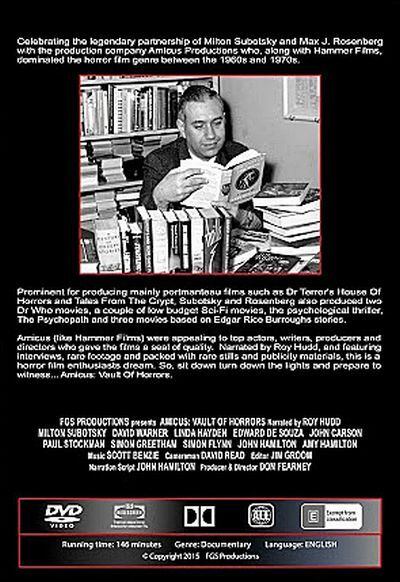 Prominent for producing mainly portmanteau films such as Dr. Terror's House of Horrors and Tales from the Crypt, Subotsky and Rosenberg also produced two Dr. Who movies, a couple of low budget Sci-Fi movies, the psychological thriller The Psychopath, and three movies based on Edgar Rice Burroughs stories. Amicus (like Hammer Films) were appealing to top actors, writers, producers and directors who gave the films a seal of quality. Narrated by Roy Hudd, and featuring interviews, rare footage and packed with rare stills and publicity materials, this is a horror film enthusiast's dream. So, sit down turn down the lights and prepare to witness... Amicus: Vault of Horrors. Cast: Roy Hudd, Milton Subotsky, David Warner, Linda Hayden, Edward De Souza, John Carson, Paul Stockman, Simon Greetham, Simon Flynn, John Hamilton, Amy Hamilton.